Crepes are delicious..need I say more?…well..yes..
Usually when I talk about cooking I talk about making crepes. I had them at a restaurant and decided I wanted to try and make them at home and they turned out great but the reaction I usually get when I talk about making them is one of awe. Maybe because they’re french or something but they have this intimidating affect on people. I hope to dispel that fear right here, right now. Crepes are so easy to make! Maybe not as easy as my Chili but it takes about the same amount of time and is really simple. There is no need to go to the fancy crepe places that sometimes charge a few dollars per crepe…I remember going to a place back in California that charged around $8 for a single filled crepe! Break eggs into medium/large glass cooking bowl. Whisk eggs and salt till eggs are uniformly yellow. Add some flour and whisk till mixed. Add some milk and whisk till mixed. Keep alternating in this way adding about 1/4 cup each time until you have added all the flour and milk. Melt the butter and whisk it into the mix. Now the mix is pretty much done. Some suggest refrigerating the mix for a few hours. I personally never refrigerate the mix when I first make it and my crepes turn out perfect. Now comes the fun/hard part 😉 actually cooking the crepes. Place 8 inch nonstick skillet on burner on medium heat. Wait till pan is evenly hot, maybe 5 minutes. Try sprinkling some water on the pan, it should evaporate immediately. Use a 1/4 cup measuring cup to scoop the batter. Hold the skillet by the handle above the burner in one hand and pour the batter into it with the other. While pouring the batter, use a twirling motion to let gravity coat the skillet evenly with the batter. When skillet is coated, plate it back on the burner. You will be able to actually see the batter cook pretty quickly. When batter is nearly all cooked, flip the crepe. This process should take about 60 seconds on the first side, 10 on the other. Flip the crepe out onto a plate and you’re ready to fill it. I will go over a few simple fillings below. This recipe will make enough batter for about 30+ 8 inch crepes. You can easily double or half the recipe but the batter will keep in the fridge, covered for about 2 weeks and the crepes will taste no different with time. If the butter separates during refrigeration, just stir it back together and you’re ready to go again. I’ve never had the batter go to waste and never cut the recipe in half. Total cost: about $1.32 for one batch! with cooking and prep time of about 30 minutes. Filling can range from any kind of fresh or frozen fruit to jams to chicken to rice to etc. It just depends what you’re in the mood for and obviously what meal you will be eating crepes for. Most people are more familiar with fruit filled breakfast crepes but I have had them for every meal and never been disappointed. You can honestly top a crepe with whatever your heart desires. Some other things we have done for breakfast crepes are peanut butter, bananas, honey, powdered sugar, granulated sugar, Hershey syrup, ice cream, frozen strawberries, and whipped cream. I don’t often make these for dinner because the wife and kids prefer the sweet toppings but we have had lemon chicken with rice in them as well. All of these are delicious. Make sure the pan is hot enough before starting to cook! 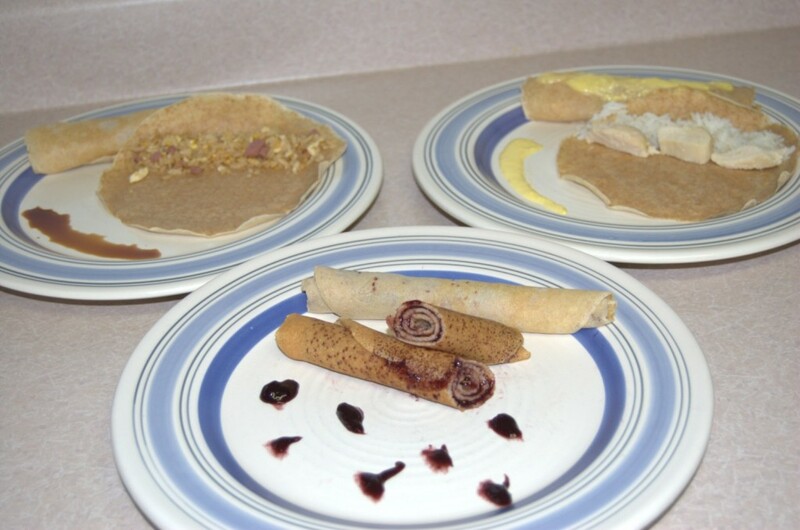 Crepes are really thin and need to cook evenly, quickly so they don’t burn. If the pan isnt hot enough all over, part of the crepe may burn, and part wont cook all the way. I usually turn the burner on when I am half way done mixing the batter to insure the pan is fully heated when I’m ready to cook. Use a non stick skillet! This really needs no explanation. If you don’t scoop enough batter to cover the pan, quickly fill in the holes with more batter. The crepe will still turn out fine. Crepes don’t have to be super thin! Some turn out thinner than others. All of the taste just as good. Even the thickest are pretty fancy and will impress. Enjoy yourself! These are really fun to make and taste so good! hmm those sound pretty good. I can’t imagine topping them with anything but fruit or sweet stuff though. thanks for the recipe! They are good! and dont knock the dinner crepes until you try em. Seriously I would love to hear feedback if you try the recipe, breakfast or otherwise. Thanks for stopping by! Woops, I replied to this comment from my email and didn’t notice this was on my Crepe recipe! Either way, if you do a dinner Crepe, the chicken is still the worst part. Breakfast crepes, I think cleanup takes more effort than anything else, some of the jams, sugars and powders sure make a mess! Harrison on Is Auto Assure a Scam? Harrison on Amazon Prime Review – Is It For You?